Yaaaay!!! One of my favorite posts to write in spring is our garden post and if I’m writing this now it means that spring HAS to be only a few weeks away! Last year I was super late getting our vegetable garden, nothing got in the ground until the end of May/beginning of June,and the garden didn’t do well. I was so late planting that we didn’t have any cucumbers, just a few tomatoes and a handful of peppers. I did accomplish my first corn but it wasn’t edible. This year I’m setting out to do better and experiment a little more. I’m going to do a vegetable garden but I’m also going to grow some herbs. I always grow parsley for our guinea pig but I’m going to expand a bit more in the herb area. All my herbs usually grow in pots on our deck so the wild bunnies don’t get them and the vegetable garden is on the side of the house where Leroy can’t destroy it. Because I’m setting out to do better this year and I’m tired of waiting for spring to be here to stay, yesterday I went ahead and planted some seeds in cartons. I’m hoping that these will go into the vegetable garden and herb pots about mid May. Another thing I’m going to try and do is incorporate more vegetables that are dog friendly so that I can share them with the boys. I’m pretty picky on vegetables but my daughter and husband love green beans and broccoli and those are heathy veggies the dogs can get in moderation so those will be new additions to the garden this year. We’ll also do the basic tomatoes and cucumbers but I think I’m going to skip the peppers. Corn maybe, and I’m thinking about giving sweet potatoes a try. As for herbs, parsley and wheat grass are a definite and probably some lemon balm, oregano, basil, sage and thyme. I recently read that lemon balm is a dog friendly plant that has a distinct lemon-mint smell and flavor. It’s a calming herb that is known to soothe and relax. It’s also known to aid in digestion by neutralizing gas in the stomach and intestines. Perfect for both Sherman and Leroy! In addition the lemony smell of this herb is said to repel mosquitoes and other insects. 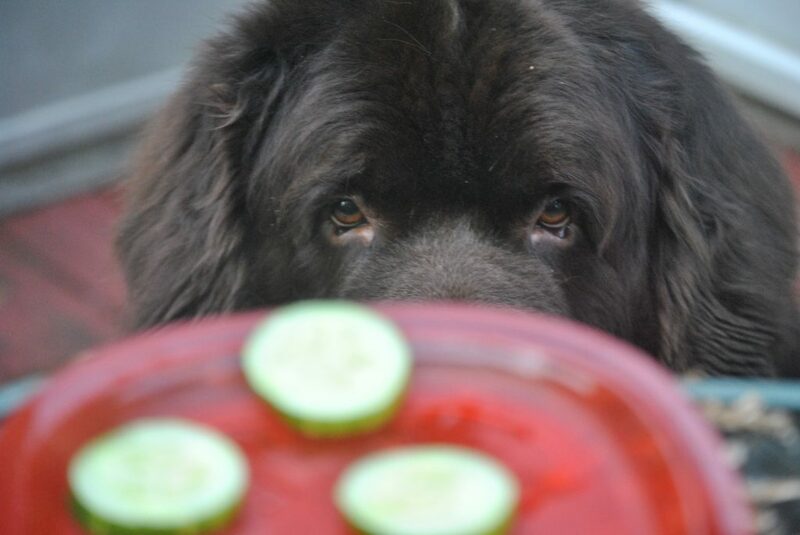 You can mince it up and place in your dog’s food, rub it on their coat or you can brew up a lemon balm tea and add to your dog’s water, make a compress or use it as a disinfecting rinse. It’s already planted! Wheat grass is another new one that will be added and I’m very intrigued by it. I’ve never personally consumed it but it seems like it might be a great addition to my diet. I’m really planting it for Sherman since he’s one to graze on grass. He’s always been this way and it has nothing to do with him having an upset stomach, he just likes to graze on grass. I thought I would see how it would go if I planted some in a pot on our deck. This way it’s not something he always has access to but it could be a nice treat for him when we go out on the deck in the summer. It’s said that wheat grass is filled with vitamins, amino acids, chlorophyll, fiber, and enzymes. and is safe for dogs. It’s VERY easy to grow also! Green beans will be a new addition to the garden too and I’m growing those mostly for my daughter and my husband but I’ve fed frozen green beans to Sherman before as a filler in his food and he loves them. Green beans are low-fat and packed with iron and vitamins. Feeding them frozen gives the dog something crunchy to chew on too! Any tips on growing green beans in the garden is appreciated! I believe I bought the ones that grow up. 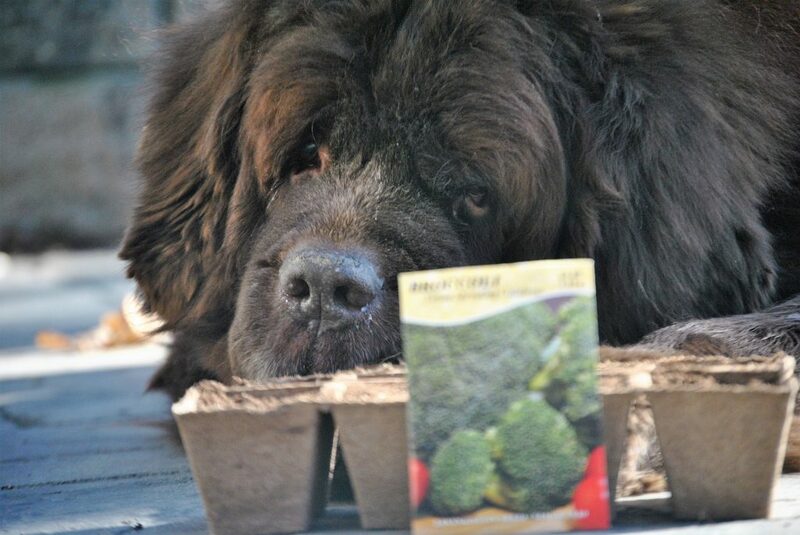 Broccoli is another new addition and another vegetable that will mostly be for my family but I’ve read that it can also be a super food for dogs too, when given in moderation. I’m pretty sure that I’ve tried to give broccoli to Sherman before and he refused to eat it but I’ll try to sneak it in. Leroy probably will not get it because it makes me a little nervous to give him too many extras in his diet no matter how low-fat they are. Kale I grew last year and I had great success with it. The problem was that I never harvested it. I did give Sherman a few bites of it but I never actually did anything with it. I’m sorry! I’m gonna try harder year. Parsley I grow every year but this year I’m going to go overboard. I always feed this to our guinea pig and I’ll be adding small amounts into Sherman and Leroy’s food. Parsley is a herb that is packed with nutrients, including vitamins A, B1, B2, C, and K, as well as calcium, potassium, magnesium, phosphorous, and iron. Parsley is also known to help freshen breath for both dogs and humans and soothe the stomach. 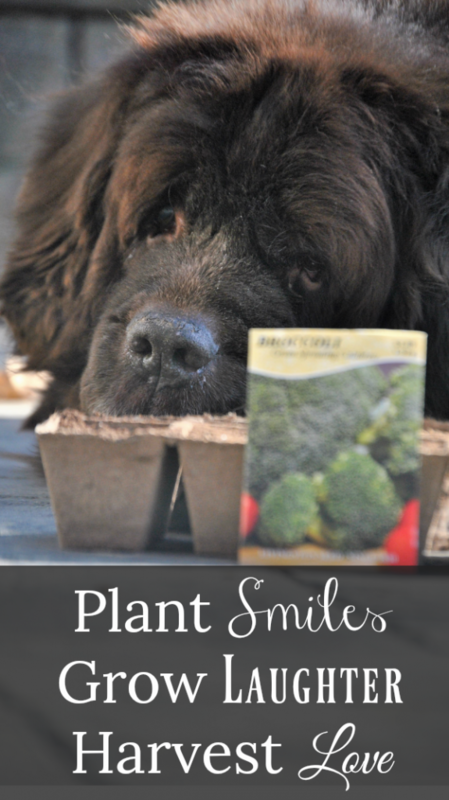 Parsley is save to give healthy dogs in moderation. It’s already planted! While I always look forward to planting my garden each spring, I think I look more forward to the walks to the garden with Sherman every night. You know, he plays a big part in the garden upkeep by peeing along the perimeter so the deer make sure to stay away from his veggies. 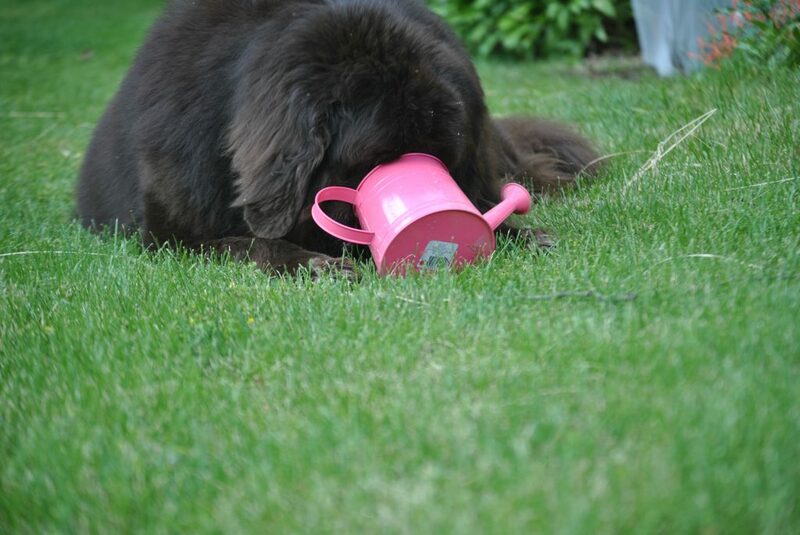 He also makes sure that I give the garden adequate water every night. So what about you? What are planting in your garden this year? And don’t forget to leave me any tips that you have! I always look forward to learning new things about gardening! **I’m not a vet! As always, it’s best to check with your veterinarian before adding any new foods to your dog’s diet and all new foods added should be given in moderation. All best wishes with your Victory Garden! I’d love to plant a few things but have such a problem with the neighborhood thugs…aka squirrels that the single $500 tomato (tally after water, etc. for the one that didn’t getting eaten by them) that survived from a few years ago really didn’t make much sense for me to flush that kind of cash down the drain…er….up to them. Ugh! That stinks! The first year that we did the raised beds I had some issues with the squirrels digging in there but nothing since! I do catch them on our deck and the chipmunks always dig up my sunflower seeds! I’m so jealous!!! Illinois weather has not cooperated with my plans for a garden. We are expanding the garden this year from a few tomato plants to sweet corn, peas, lettuce and green beans as well as herbs after we fence it in to keep the big brown fuzzy menace from digging everything up faster that I can plant it. Moses loves loose dirt and can churn it up almost as well as the garden tiller! Good luck with the corn! I did some last year and while we didn’t get any that was edible,( I don’t think it was warm enough last year) I was SO surprised to see actual cobs grow! I’m gonna try again this year! I’ve been wanting to do lettuce too but was thinking of doing it on some type of table set up! I hope your garden goes good! Let me know! Like Monika, we have tree rats – and a certain little black dog – who would just LOVE to eat whatever we might plant, so no garden. I’d love to grow some rosemary and lavender, but have no window ledges to sit pots on. Oh well. I’m gonna try lavendar this year too! It’s one of my favorites!